Many of us use Twitter. It’s an amazing way to connect with people and businesses that we may not be able to otherwise. Social media can actually be a huge learning tool – and not just for students but universities. In fact, we might be able to learn a lot about a college by analyzing what types of tweets they attract. Do people praise or complain about them? To gain some insight, we gathered over 100,000 tweets mentioning universities and analyzed their sentiments based on the prevalence of positive and negative words. Here’s what we found out about postsecondary pride. 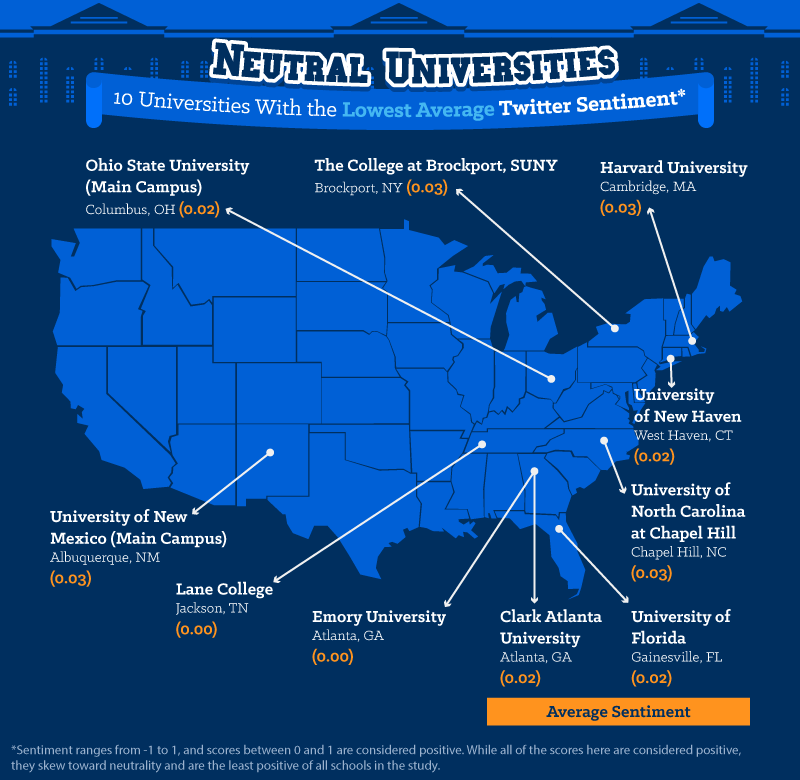 These 10 universities have the distinction of having the highest average Twitter sentiment. In other words, tweets directed at these schools trended on a more positive side instead of coming across as more neutral or negative. Sentiment ranges from -1 to 1, and scores between 0 and 1 are considered positive. It’s important to note although the scores here are considered positive, some skew toward neutrality but are the most positive of all schools in the study. 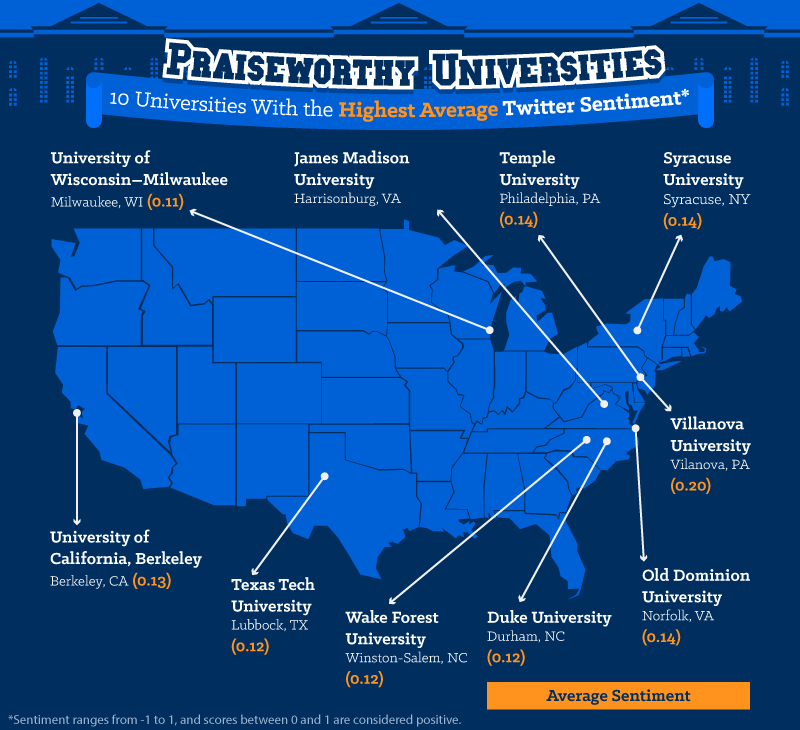 The most positive-sentiment school in this category is Villanova University, with a tweet rating of 0.20. It’s followed by Syracuse University in New York, which shares a tweet sentiment score of 0.14 with Temple University in Pennsylvania and Old Dominion University in Norfolk, Virginia. James Madison University in Virginia rounds out the top 5 with a tweet sentiment of 0.13. Emory University in Georgia comes in at a solid 0.0 on the sentiment scale – a true neutral. Since Emory is a highly regarded school, this might sound surprising; however, in recent months, there was some controversy over how the school’s administration handled on-grounds graffiti that led to campus unrest. This may help explain the overall neutrality of the tweets directed at the school. Lane College in Jackson, Tennessee, is also locked in at a perfectly neutral 0.0. But the other schools represented? They skew a bit more positive. University of New Haven, University of Florida in Gainesville, Ohio State University’s main campus, and Clark Atlanta University all have an average tweet sentiment of 0.02. 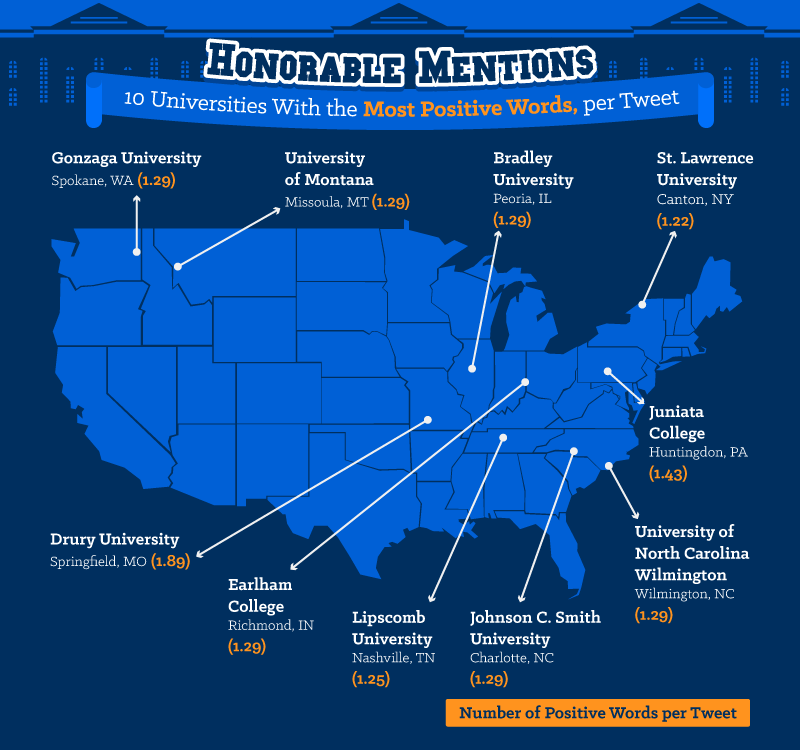 Here, the university that receives the most positive words per tweet is Drury University in Springfield, Missouri, at 1.89 positive words per tweet. It’s followed by Juniata College in Pennsylvania, which comes in at 1.43 positive words per tweet. 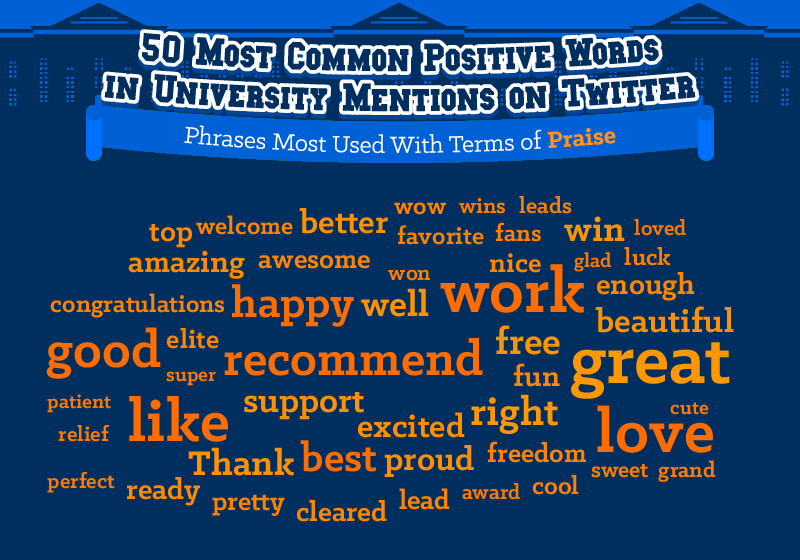 Next, we show Bradley University in Illinois, Earlham College in Indiana, and Gonzaga University in Washington, Johnson C. Smith University in North Carolina, the University of Montana, and the University of North Carolina in Wilmington – all of which are actually tied at 1.29 positive words per tweet. 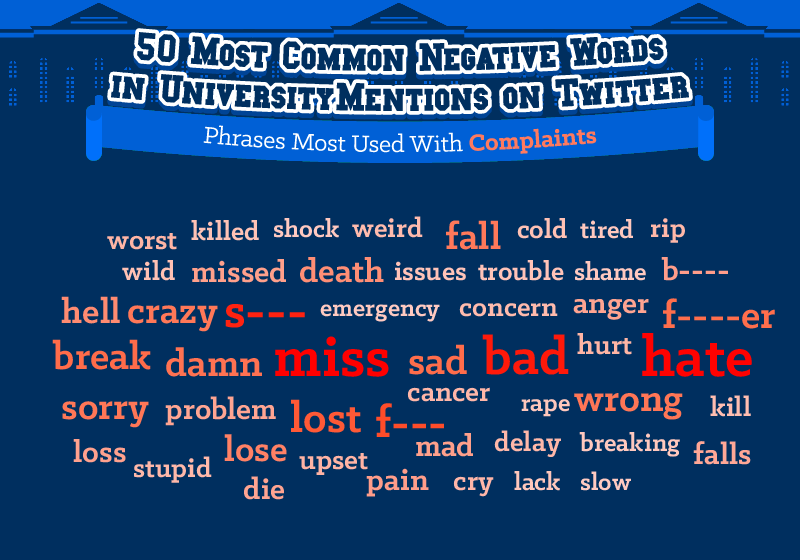 Alternatively, these universities have attracted the highest average of negative words per tweet. Interestingly, Emory University, which has the unwelcome distinction of having the lowest sentiment tweet activity overall, doesn’t come in at No. 1 here. Instead, it lands in the No. 7 spot, with an average negative-words-per-tweet rate of 0.48. 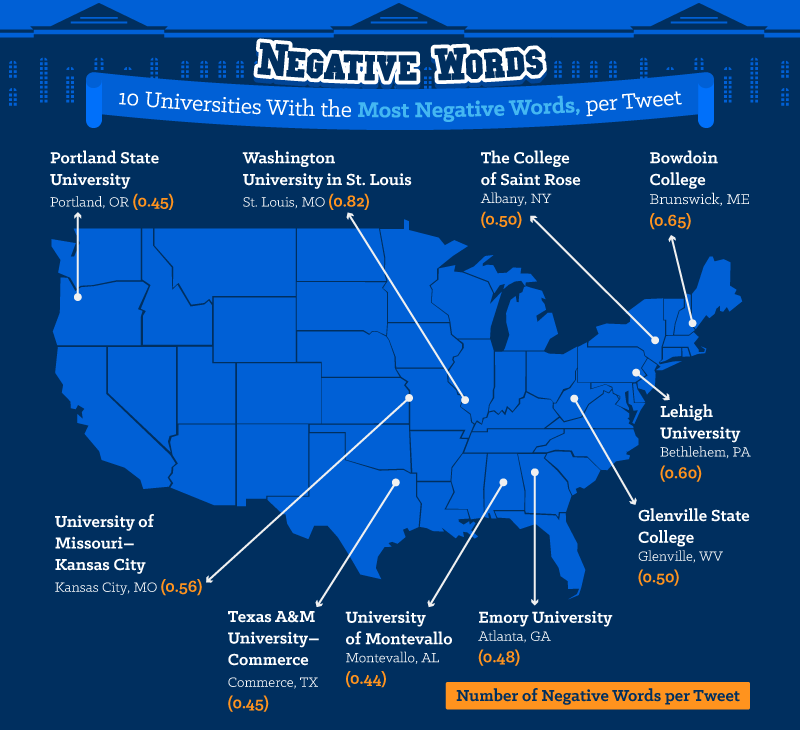 The top spot actually goes to Washington University in St. Louis, Missouri, which has an average negative word count per tweet of 0.82, followed by Bowdoin College in Maine (0.65 negative words per tweet), Lehigh University in Pennsylvania (0.60), University of Missouri – Kansas City (0.56), and Glenville State College in West Virginia and The College of Saint Rose, both of which clock in at 0.50 negative words per tweet. The universities previously mentioned might be happy to be associated with some of the positive words above. Terms such as “great,” “good,” “like,” “love,” “happy,” and “recommend” are some of the most frequently used positive words. Words such as “awesome,” “wow,” “well,” “beautiful,” “support,” and “excited” also rank for their positivity. Negative words can take many forms, and curse words are often found among them. Some of the most common negative words we found directed at universities were unkind, to say the least. But there are plenty of other negative words that were inoffensive, such as “break,” “bad,” “miss,” “sorry,” “lost,” “hate,” “crazy,” “hurt,” “wrong,” and “sad.” More troubling terms – such as “concern,” “pain,” “mad,” “delay,” “problem,” and “lose” – are also fairly frequent contenders. Universities are no strangers to social media – and their students definitely aren’t either. Tweets directed at these schools take all forms. Not only can prospective students log in to Twitter to see the general vibe of a school, college staff and administrators can tune in to either address concerns or revel in praise. For all the college info you could ever want – including hard facts and stats about tuition, class size, graduation rates, admission test score averages, and more – check out CollegeStats.org. We collected 103,000 tweets between March and April of 2016 mentioning universities’ Twitter handle. The tweet corpus was stripped of numbers, symbols, and extra white space. We then used the data to create a term-document matrix (TDM) containing unigram word counts where each university represented a document (column). Using the qdap and tm packages in R, we fed tweets mentioning each university through the tm function polarity to determine their average polarity (-1 is negative sentiment, +1 is positive). It should be noted that this sentiment analysis can’t take into account the full context of a tweet or text sample.